It's a Mom Thing Reviews & More! : Ways to Celebrate Earth Day with Children! 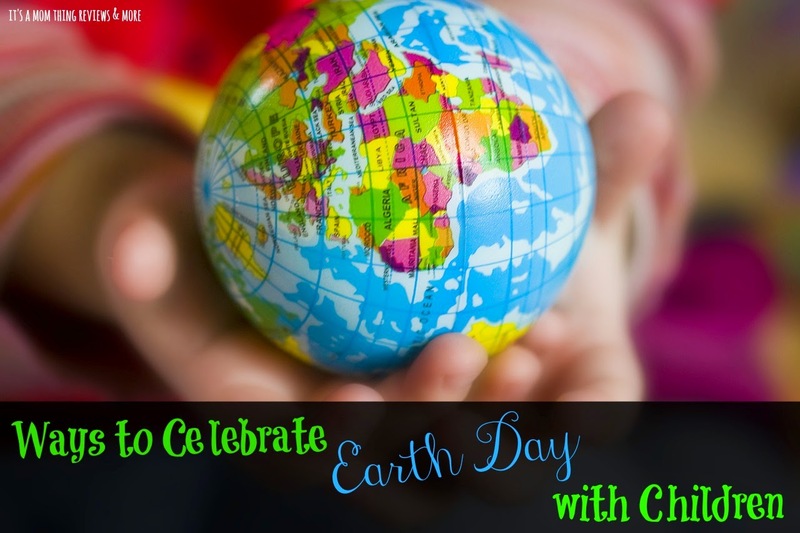 Ways to Celebrate Earth Day with Children! Earth Day is this week and it is the perfect time to teach or remind your children about ways to take care of the Earth! Whether you get outdoors and enjoy nature or find ways to celebrate indoors there are lots of fun ways to celebrate with your children! Below are some of our ideas of ways to celebrate! Head outside and plant some flowers, veggies, fruits, herbs, or even a tree. Let your children pick the types of the items you choose to plant. If you do not have a year than plant them in pots or window boxes. Give your children the responsibility to help care for the plants. Take a nature walk or hike. Whether you visit a local park to walk around or plan a hike on an organized trail take your children outside to enjoy nature. Bring a basket or bag and allow them to pick up rocks, pine cones, leaves, and other items to observe or use in crafts. If your little ones aren't in school yet and the weather is nice take them outside for a picnic lunch! If you aren't able to have a picnic lunch but have a place outside that you could have dinner that would be great too. Teach your children about the three R's. Reduce: Teach children about conserving electricity by turning off lights and appliances when they are not in use. Also teach them about reducing the amount of water that they are using by doing things like turning off the sink while brushing teeth and making sure the water is always fully off when they are done with it. Reuse: Use household products for craft projects or other uses. Donate unused household items or clothing. Recycle: Talk to your children about reasons to recycle. If you do not have spaces to put recyclable materials designate ones for paper, plastic, and aluminum; waste bins, plastic totes, or even cardboard boxes would work perfectly. If you have younger children allow them to decorate the containers so that they can see visually which container is for what. Do some crafts involving nature or reusing items! Some ideas are: painting rocks, making pine code bird feeders, planting seeds in egg cartons, make a birdhouse out of a milk carton, and paper towel tube kaleidoscope. You can also search Pinterest and find tons of amazing ideas! Take the day to unplug entertainment electronics such as television, video games, tablets, phones, etc. Instead of using electronics play outside, go to the park, craft, cook together, or more fun ideas!